It happens every January. But still, it always catches me off guard and leaves me feeling bleak. The dreaded January thaw. One night of rain and our gorgeous snow base is diminished by half. One night of freezing temperatures turns our world into an awkward skating rink. A funk envelopes the house. My husband Mark mopes around and resolves to go biking with studded tires instead skiing on the trails. I stare out at the garden through the fog, searching for solace. It’s only a tease though. I know better. The only member of the household who finds meaning in this gray bout of mucky of weather is our dog, Earl. 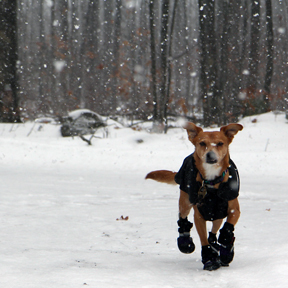 He gets a reprieve from suiting up in full winter regalia before heading outdoors. And like magic he can smell the earth again. His walks take on new significance. He lingers over scents unknown to me, no longer anxious to sprint back to the warmth of the house. His nose goes into overdrive when he catches something in the wind. I try and let his delight trickle down to me. I’ve been through this before, I tell myself. I know what to do. I queue up a few classic episodes of The Office – like the one where Dwight forms an alliance with Jim and stages a secret operation from a cardboard box, or when Ryan (the temp) starts a fire in the break room with his cheesy pita, or maybe for one final belly laugh, the episode where Andy Bernard does the splits in his dance routine and lands on his car keys. I’m smiling already. Then I head to the kitchen, open a bottle of Sangiovese, and start rummaging. Potatoes, leeks, mushrooms, shallots, a little wedge of Gruyère, and a splash of cream. That’s right. It’s time for a gratin. I’m pretty sure that January was made for gratins. When else can you get away with a layer of browned cream and nutty cheese atop your vegetables? Or rather, when can you get away with AND feel good about it even? During a January thaw. That’s when. I put the gratin in to bake and call Mark to my home office to escape into a much more amusing office. And later, when our spoons break through that golden brown crust to the goodness below, we sigh and revel in momentary potato induced amnesia. What weather? My plan is working. Maybe even too well. By the time I repurpose the leftovers with a fried egg on top a few mornings later, the thermometer has plummeted back into single digits. It’s still disastrously icy, but I feel a little bit better about the whole thing. 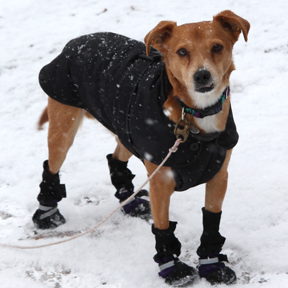 Earl, on the other hand, is ready for spring. Saute the leeks in 1 tablespoon of butter over medium heat until softened, about 5 minutes. 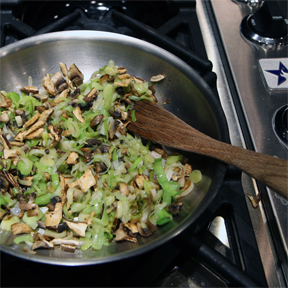 Add the mushrooms and shallots and reduce the heat to low. Cook for about another 5 minutes until the mushrooms begin to give off their moisture. Add a generous pinch of salt. Slice the potatoes very thin – a mandolin makes quick work of this. I prefer my potatoes unpeeled, as long as the skin is relatively tender. Layer half of the potatoes in the bottom of a well buttered 8 1/2 x 11-inch casserole dish. Spread the leek and mushroom mixture over the potatoes, followed by half of the cheese. Give a sprinkle of salt over this if you’d like. Then layer on the remaining potatoes. Scatter the rest of the cheese over the top. Gently heat the broth and carefully pour this over the potatoes so that the majority of the liquid rests under the potatoes and cheese. Drizzle the cream over the top and finnish with a grating of nutmeg and white pepper. 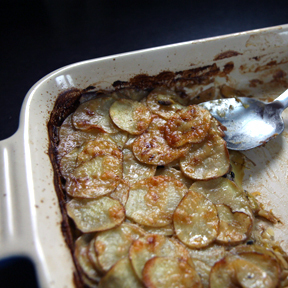 Bake in a 400º F oven for 50-60 minutes until the top is thoroughly browned and the gratin looks compact. Serves about 6 as a side. Speaking of potatoes, I was planning to make gnocchi tonight. But I might switch to your gratiné. Earl is styling!